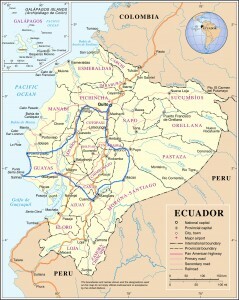 My first thought after touching down in Guayaquil, Ecuador in February 2012: South America is is closer than I thought. 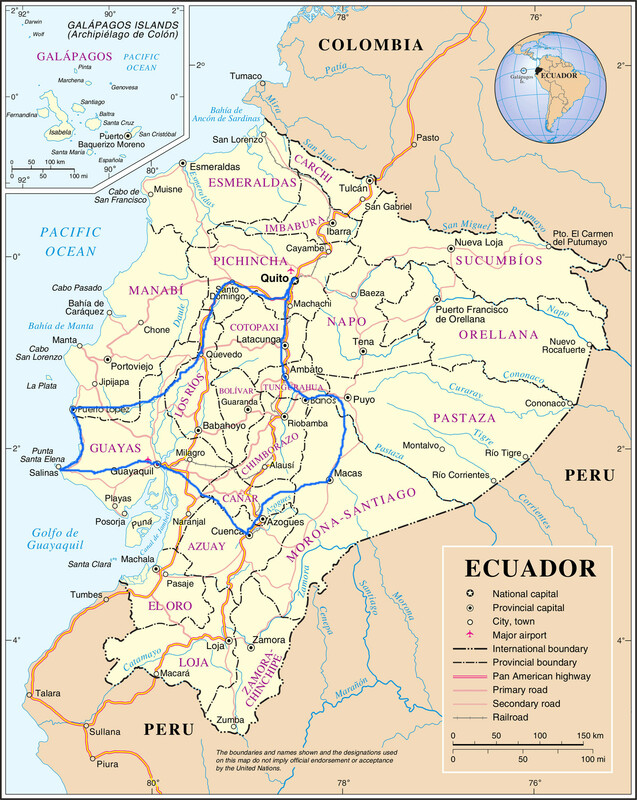 I had flown there with my friend Chris, and the two of us were meeting up with a third friend, Carlos, who was Ecuadorian by decent and had arrived a week earlier to spend time with his family. The flight from Boston had been an easy one: a quick hop to Miami, then another quick hop to Ecuador. Despite the layover, it had been a far less painful travel experience than anticipated. 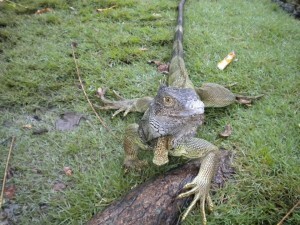 In addition to spending a bit of time with Carlos’ family, both in Guayaquil and on the coast, the three of us planned to rent a car and spend the bulk of the trip on the go, exploring Ecuador by road through jungles and mountains, with planned stops in a few specific towns along the way. Carlos’ family helped facilitate the trip by putting all of us up for a couple of nights, playing chauffeur to and from the airport, and helping us navigate the Ecuadorian rental car process, which involved some advanced Spanish-only haggling that I think even Carlos, a far more proficient speaker than I, felt nervous about going alone. Obtaining the rental car occupied the bulk of our first morning in the country, but we still had time to check out El Parque de las Iguanas (a small park in the center of the city where the Iguanas run wild) and take a walk down el Malecón, a new walkway along the Guayas River. We also joined Carlos’ cousin, who had assisted with obtaining the rental car, at one of his local lunch haunts for some tasty fish, shrimp and rice. Bellies full, we were on our way around mid-afternoon. Guayaquil is not a pretty city, but the countryside that began soon after we left was green and lush, although noticeably dotted with reminders of the poverty that was a daily reality for many. The ride to Cuenca took us through the mountains, at times affording us beautiful views of the countryside below, and at other times, no views at all. Around the top of the mountains we encountered a long stretch of road where the fog was as thick as pea soup and visibility was nonexistent – like driving through the clouds. Luckily, Carlos did well despite the conditions, and we arrived safely in Cuenca in the early evening. Our destination was Hostal Macondo, which was recommended in our guidebook and online – for good reason, we soon found out. It was easily one of the nicest hostels I’ve stayed in. With clean private rooms, charming garden-filled grounds and a complimentary breakfast, it could have easily gotten away with marketing itself as something a bit more upscale. After checking in, we headed into town for a look around and a bite to eat. Cuenca is a lovely mountain town with a distinct colonial feel – a nice change from Guayaquil. We found a restaurant that was billed as “authentic” in our guidebook, and although a part of me was skeptical that anything listed as such could actually fulfill the description, we did manage to have a good meal. I ordered seco de pollo, a traditional dish described as an Ecuadorian stew but that more resembled a simple piece of chicken with sauce on top. Either way, the flavor was good – no complaints. Outside our restaurant street musicians had started playing and a group of spectators and dancers began to grow. It was a happy, lively neighborhood atmosphere and a fun thing to stumble upon after dinner. The three of us took a spin around the gardens in the center of town, absorbing the ambiance and admiring the colonial buildings and churches that surrounded the garden. We finished the evening with a cheap bottle of wine that we brought back to the hostel and shared in the gardens over numerous games of cards and good conversation.